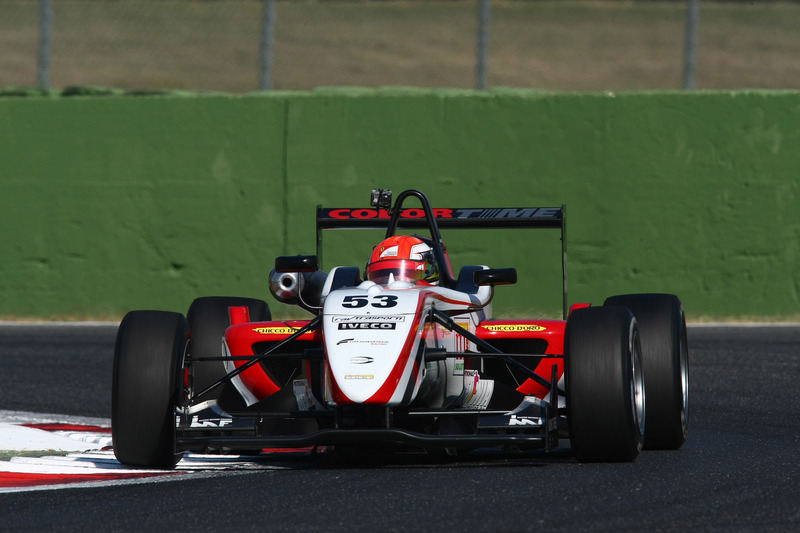 17/09/2011 - Raffaele Marciello set the pole position in the sixth round of the Italian Formula 3 Championship in Vallelunga at the end of an eventful qualifying session. Thanks to a monstre lap of 1´29.953 at an average speed of 163.485 km/h, the Ferrari Driver Academy pupil gave more than three tenths to the rivals. Not only he broke the previous record lap (1'30.361 at an average speed of 162.747 km/h) set last year by Cesar Ramos, that was awarded Italian Champion at the end of the season, as the 16 years old Swiss completed his best lap at a pace not bearable by all the others, with 12 drivers within 1 second. Marciello's masterpiece arrived in lap three on the second set of tyres after ending the first part of the session just 18 thousands of a second shy of the provisional pole held by Sergio Campana (BVM-Target). The driver from Modena has later on been protagonist of an unlucky episode that prevented him from fighting until the end. Back in the pits and with new tyres on, his single seater could not start due to a technical problem to the starting mechanism. Forced to live the last minutes of the session from the pit wall, Campana saw his laptime (1'30.300) being beaten by Marciello and kept the front row together with a precious set of new tyres to wear in race one. Second row for the Californian Michael Lewis (Prema Powerteam), as he could not improve the third time in the last part of the session (1´30.374) and Edoardo Liberati (Team Ghinzani) who set a fastest time of 1´30.446 without managing to improve with the second set of tyres. Maxime Jousse was fifth for BVM-Target and will start in third row with Facu Regalia (Team Ghinzani) on his side and behind him Victor Guerin (Lucidi Motors) did not manage to lower the laptime of 1´30.698 obtained on the first set of tyres. Eighth and pole sitter in the second race will be Brandon Maisano (BVM-Target) that was 8 tenths slower than the pole and hundreds faster than Kevin Giovesi (Lucidi Motors); Lucidi's driver appeared to be struggling after the encouraging second place set in free practice yesterday. Simone Iaquinta (JD Motorsport) ends the Top-10 ahead of Eddie Cheever (Lucidi Motors), while Federico Vecchi (LineRace-CO2 Motorsport) set the 12th fastest time ahead of Andrea Roda (Prema Powerteam) but he used just one set of tyres in the final part of the session, saving therefore one for the race. The appointment is now for this afternoon at 16.05 (local time, GMT+2) while tomorrow's race two is scheduled for 10.10.